This article examines the constitutional validity of business combination antitakeover statutes. 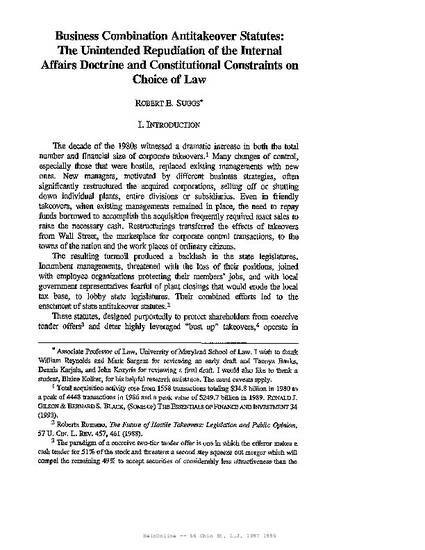 Delaware and other important corporate law jurisdictions enacted these statutes during the 1980s to inhibit hostile leveraged corporate takeovers and protect incumbent managements. These statutes work by prohibiting transactions which enable a hostile acquirer with a mere majority of target stock to sell target assets for cash and retain all the cash to service acquisition debt while paying off with securities the minority shareholders' interest in the assets sold. This allows the takeover to be financed with the assets acquired. Analyzing the structural operation of these statutes in greater depth than either the courts or other commentators reveals previously unidentified bases to challenge their constitutional validity. Using the Delaware statute as an example, the article describes a series of transactions which either evade the prohibitions of these statutes or require the enacting jurisdiction to repudiate the internal affairs doctrine for their prohibitions to remain effective. This doctrine is the consensus choice of law rule for all U.S. jurisdictions and one virtually constitutionalized by CTS Corp. v. Dynamics Corp. of America. Existing assessments of the constitutionality of these statutes have focused on the fact that they explicitly apply only to target corporations incorporated in the state enacting the statute. In this respect they appear consistent with the internal affairs doctrine, which looks to the jurisdiction of incorporation to determine the controlling law for matters peculiar to corporations, such as voting rights and board duties. This appearance of consistency with the internal affairs doctrine is deceiving. The effective application of these statutes to the described transactions requires the repudiation of the internal affairs doctrine because these transactions involve no formal corporate action by the Delaware target. Instead, they use foreign majority owned subsidiaries of the target. Only if Delaware law controls the internal governance of these foreign subsidiaries can the business combination statute actually bar the transactions. Since the antitakeover prohibition applies even without injury or harm to the Delaware target, these statutes go far beyond well established prohibitions against cleverly structured self dealing or unfair transactions. Without injury to the Delaware target, Delaware's antitakeover statute essentially mobilizes the private, economic power of the Delaware target to control the internal decisions of its foreign subsidiaries (whose very existence is owed to their own jurisdictions of incorporation and their governance requirements) to compel compliance with Delaware's prohibitions. To extend its regulatory mandate extraterritorially in this manner without the jurisdictional basis of injury within its jurisdiction exceeds constitutional limits. If Delaware's antitakeover statute purports to govern the internal affairs of a foreign subsidiary, then Delaware and the subsidiary's state of incorporation both claim to govern the internal affairs of the same corporation. Moreover, upon completion of the bidder's tender offer, the Delaware target becomes the bidder's majority owned foreign subsidiary. This status provides the bidder's state of incorporation with the same legislative basis as Delaware to extend its own legislative mandate over foreign subsidiaries, including the Delaware target. The bidder's state could then enact an antidote statute to Delaware's and supplant Delaware law for the internal affairs of the Delaware target. The potential for inconsistent or conflicting state regulation created by this situation exceeds what the Supreme Court found sufficient under the dormant commerce clause to invalidate an earlier generation of antitakeover statute in Edgar v. MITE. These statutes are vulnerable to constitutional challenge on other grounds as well. For a state to deviate from the internal affairs doctrine as its choice of law rule only when necessary to prevent a foreign corporation from escaping its regulatory jurisdiction may well violate the equal protection clause even under rational basis scrutiny. Lastly, the assertion of regulatory power over a foreign subsidiary, absent either contact with the regulating state or harmful effects within its jurisdictional territory, is an extraterritorial exercise of power fundamentally inconsistent with a federal system of co-equal sovereign states and in violation of due process. 56 Ohio State Law Journal 1097 (1995).